After a night at the ballet, I was joined by Julienne Viola, General Manager, Freed of London, for a late night supper at the busy midtown bistro, Jack's. One can dine with elegance and wine or order a casual dinner and beer. Liam, at the bar, is a fixture at Jack's, and I am impressed with the rapid pace of his drink creations for Jack's non-stop crowd. Tonight my guest ordered grilled chorizo, manchego cheese, and tomato served on warmed naan bread for an appetizer. 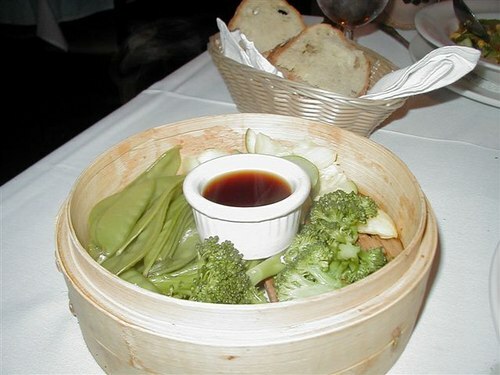 I ordered steamed vegetable dumplings, served on a bamboo rack. 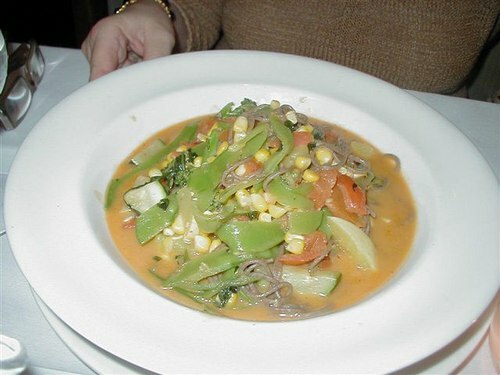 For entrees, my guest enjoyed fresh garden vegetables simmered in a Thai coconut curry broth with soba noodles. The vegetables were al dente and delicious. 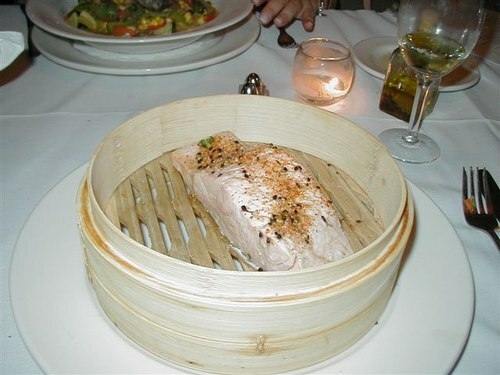 I enjoyed another steamed dish served on two bamboo racks - steamed rare salmon dusted with schichimi, served with ginger soy dipping sauce, and seasonal vegetables. For dessert, we each ordered fresh orange and pineapple sorbets, cappuccino, or espresso. Larry and Liam, Jack's Proprietor and Bartender, are from Ireland. But, the menu includes dishes from around the globe. Call 212.869.8300 and make a reservation for lunch, brunch, or dinner at Jack's, in the heart of NY's theatre district. Tell them you saw them on RobertaOnTheArts.com and ExploreDance.com.